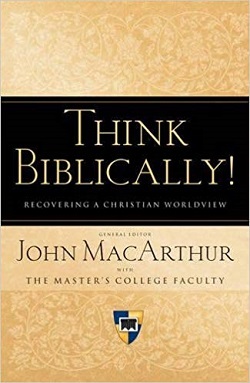 Now in paperback, this helpful volume by pastor and best-selling author John MacArthur guides readers in cultivating a biblical worldview on a wide range of issues. What we think shapes who we are. Thats why the Bible tells us, Do not be conformed to this world, but be transformed by the renewal of your mind (Romans 12:2a). In a world of differing voices competing for our allegiance, we must learn to think biblically so we can distinguish good from evil. God is the Creator of this world; his voice-his Word-must guide our thoughts and our lives.